Amateur hackers are alarmed with the apparent demise of LeakedSource, a controversial breach notification site that’s been accused of doing more harm than good. U.S. law enforcement has allegedly confiscated its servers, and now some hackers are wondering if customers of LeakedSource might be next. “All the people who used PayPal, credit card, etc. to buy membership, the FBI now have your email, payment details and lookup history,” wrote one user on HackForums.net. 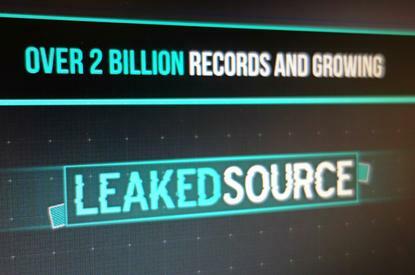 LeakedSource had functioned as a giant repository with more than 3 billion internet accounts -- all of which had been compiled from stolen databases, taken from the likes of LinkedIn, MySpace, and Dropbox. For as little as US$2 a day, anyone could use the site to look up password and other login information. But whether the FBI really shut down LeakedSource is still unclear. The site itself has been offline and its operators have been mum on Twitter and through email. In addition, the U.S. Department of Justice has declined to comment. Nevertheless, experts in data breach notification said the situation with LeakedSource was inevitable. “They weren’t handling the data ethically or responsibly,” said a data collector who goes by the name Keen. He runs a separate notification site at Vigilante.pw that tries to warn the public about the latest data breaches. But unlike LeakedSource, he doesn’t make the data searchable or post any sensitive user information. Nor does he buy stolen records obtained by hackers. The same can’t be said of LeakedSource, he claimed. He suspects this was the case with the December data breach at E-Sports Entertainment Association (ESEA) that involved a hacker seeking a $100,000 ransom. LeakedSource managed to receive the stolen database, which Keen found odd. Troy Hunt, an Australian software architect who runs a separate breach monitoring service, also approved of LeakedSource’s apparent shutdown. In a Friday blog post, he wrote that LeakedSource even had searchable information on his internet accounts. There was also “never any doubt” the service was being used for malicious purposes, Hunt said. He posted screenshots of Twitter users saying they had used LeakedSource for hacking activities. Others online have wondered if LeakedSource’s apparent closure is a publicity stunt, but Keen disagrees. Users on HackForums are already looking for alternatives. One alternative talked about has been LeakBase.pw, a site that offers similar services. However, the operators of LeakBase want to avoid any federal investigation. "If the government genuinely considers our service a threat we will have to shut down as well," the service said in a Twitter message. "Our team has no intention of breaking the law." The service is adding new features and policies to help reduce possible user abuse. "We want to keep offering a service where anyone can search their own data," it said. "After all, the data is already in the hands of many hackers."